This is a guide to the dimensions of different brands of bagpipe bags on the market. These measurements should help you compare and select a bag that is appropriate for you. Height below represents the meaurement taken, while the bag is laid flat, from the fold at the top of the bag down the widest part of the bag middle to the opposite side. 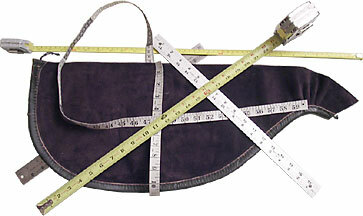 Length is the full length of the bag from tail end to the tip of neck, though the effect of this measurement may vary a bit if the bag is a swan neck. In the case of a swan neck, the bag should be considered equivalent to a somewhat longer bag. Please keep in mind that there will be some variation in the manufacturing of bags. While they should be fairly uniform, most are stitched by hand feeding the material through a heavy-duty sewing machine which results in a bit of variation. Plus most materials will shrink and expand some depending on temperature and humidity. Just don't be surprised if a bag is off by the width of your finger. Also be aware that there will be differences in the diameter of bags with grommets (stock collars) versus bags that are tied in. A bag requiring a tie-in will "lose" material from its effective diameter in order to hold the stock in place. For otherwise equal bags, a collared bag will have a larger effective diameter. Makers with grommeted bags may position the grommets futher forward of what is considered standard, such as the Livingstone bag made by Ross. Others, such as the Willie McCallum bag by Bannatyne may alter the cut of the bag to better suit some body shapes. In the chart below there are references to "color codes" for the Ross bags. These color codes are located inside the collar for the blowpipe stock. For the Monarch bags, color codes refer to the color of the circle material surrounding each grommet: maroon is small, green is medium and blue is large. Please note: Gortex/Canmore bagpipe bags have not been confirmed with the manufacturer, so take their numbers with a "grain of salt" as they may change. I submitted web contact form back on Jan.20,2005 and never heard back. Spring 2009, it was reported in the UK news the Canmore bags manufacturing was shutting down. Please note that Monarch Bagpipe Bags is no longer in business, but included below regardless. Bannatyne, Begg, Bennett, Bowes, Gannaway, L&M, MacHarg, R.G. Hardie, Shepherd. Probably the most common mistake pipers make is getting a bag that is too large for them. Things that affect appropriate bag size are overall arm length, chest shape, and blowing technique. If you are having trouble comfortably reaching the chanter (assuming your stocks are correctly positioned on the bag), or have a lot of pressure from the bag on the inside of your forearm, then your bag is too large. Sometimes a short, large chested person can have a custom longer bag made to compensate for a smaller circumference. Over the years a number of bands have mandated small bags for their members regardless of their physical proportions—small bags mean less air, less air means more reliable cut-offs. But bag size will also slightly affect the tone of your pipes, which may or may not be an issue for you. Some pipers swear that they get noticeably better resonance and tone with a larger bag. (Though if your bag is full of hoses, valves, water trap systems, car keys or other objects, all bets are off regarding a bag's tonal qualities!) Others say they can blow less often with a larger bag. The best way to determine the ideal bag size for you is to simply try different sized bags. Short of that, consult your instructor, your pipe major, or favorite retailer for advice. If you are wondering if your bag is too large, you can use a temporary "corset" to effectively shrink the size of your existing bag. A cut-off pants leg can serve the purpose or a swath of fabric sewn or securely stapled. Regardless of how it's constructed, the diameter should be smaller than your bag. The "corset" is slipped over the deflated bag then the pipes are played. If you find that the smaller effective diameter is an improvement, then consider a smaller bag. If it's not an improvement and you are still unhappy, perhaps investigate a different brand in a similar size. A number of bag makers will custom make a bag to your specifications. Providing a bag template—paper or otherwise—is a good idea and in some cases, is required. Expect to pay a higher price for all the extra handling involved by the maker. Also expect that turnaround time may be on the order of months rather than weeks. Most bag makers work through a retailer, that is, you contact a bagpipe supply shop and purchase your bag through them, who in turn places your order (usually along with a number of other bags at one time) with the bag maker. Here are some makers known to make custom bags: Ross Bagpipe Reeds Pty. LTD., L&M Highland, Bennett Pipe Bags, Bowes Bags (9"-12" height), Monarch, Moose. Other makers may also be willing, just inquire with them. Bennett Pipe Bags (Scotland). Formerly known as pipebags.co.uk. D&M Gannaway, Ltd. (New Zealand). L&M Highland Outfitters. (Nova Scotia). No direct sales. R.G. Hardie & Co (Scotland). No direct sales. R.T. Shepherd & Son Ltd. (Scotland). Ross Bagpipe Reeds Pty. Ltd. (Australia). No direct sales. W L Gore & Associates (UK) Ltd. (Scotland). No direct sales. After You Have Your Bag. Once you have your bag, if it's not synthetic, you may want to visit my articles covering how to tie-in a bag and also how to season a bag. This page last updated Monday, February 18, 2013. Page first created in December 27, 2004.